One race. Two championship bids remain. There is so much anticipation as the Monster Energy NASCAR Cup Series heads to the new-look ISM Raceway in Phoenix this week to set the final two positions eligible for the series Championship 4. Kevin Harvick won Sunday at Texas Motor Speedway to secure his fourth championship run in five seasons. Team Penske’s Joey Logano won at Martinsville Speedway two weeks ago to punch his first ticket to the title race in two years. That leaves two positions remaining to earn a chance in the title bout. Regular season champion Kyle Busch holds a 28-point edge on the field going to Phoenix. And reigning series champion Martin Truex Jr. sits 25 points to the good. Kurt Busch, Chase Elliott, and Stewart-Haas Racing teammates Aric Almirola and Clint Bowyer round out the list of eight eligible Playoff drivers, who will essentially need to hoist a trophy at ISM Raceway to earn their opportunity at the 2018 Monster Energy Series title. If the race winner of Sunday’s Can-Am 500 is one of the eight championship-eligible drivers, he would automatically earn a position in the Championship 4. If not, then two drivers from that group of eight would advance based on points. All four Stewart-Haas Racing Fords are among those still vying for a title – Harvick, Kurt Busch, Almirola, and Bowyer – and it’s the only four-car team to have all its drivers advance this far in the title run. “Just the fact that we were able to get all four of them this far is an accomplishment, a huge year for our company,” team co-owner Tony Stewart said Sunday. “Couldn’t be more proud of everybody. But the reality is we knew, everybody knew when they started the Playoffs that those first three spots were already for the most part taken unless they had a natural disaster happen. Of the four drivers essentially needing a victory to break into the top-four in the standings – only Kurt Busch has won at ISM Raceway before. His brother Kyle and Joey Logano each have a victory too. 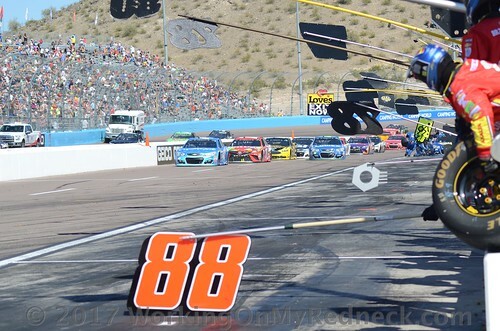 Harvick scored his ninth win at ISM Raceway this spring – most among the field; double that of any driver entered this week (Jimmie Johnson is next best with four wins). Harvick’s Phoenix mastery includes a massive 1,522 laps led at the track compared to 827 for Kyle Busch – the two largest lap totals among the current eight Playoff drivers. Kurt Busch is next with 757 laps out front. Among those still looking for that first Phoenix trophy, Truex has led only 104 laps in 25 starts. Elliott – the lone Chevrolet still running for the crown – has led 140 laps in only five ISM Raceway starts. Bowyer has led only 22 laps in 26 Phoenix races and Almirola is still looking for his first lap out front in what will be his 16th start. Counting Harvick’s victory on Sunday, six of the eight Playoff drivers finished among the top-10 at Texas. Kyle Busch was 17th and Bowyer, who qualified on the outside pole position, was 26th. “That stinks, first corner of the race,” Bowyer said of contact on the opening lap with Denny Hamlin. “I’m sick. It wasn’t what we were hoping for today. We were having to turn right to get into the corner and were ploughing in the middle. I think something was going on with the car when it was getting in the corner. “We’ll go to Phoenix and try to win. This isn’t over yet,” said Bowyer. Past statistics certainly may not predict the outcome this week either. The track is debuting an incredible $178 million makeover featuring not only new fan amenities but the one-mile oval itself will present differently. The start-finish line is essentially flip-flopped with it now located where Turn 2 used to be. Whether Harvick’s previous amazing work at the track can be replicated on the fresh layout remains to be seen. Certainly, there is plenty of motivation from the other Playoff drivers realizing this is their last opportunity to “win” their way in to a shot at the sport’s biggest trophy. The entire slate of championship chasers turned in good showings at Phoenix earlier this year. All four of the drivers essentially needing to win to secure a championship position scored top-10 finishes there this March. Kurt Busch was 10th, Elliott was third, Almirola was seventh and Bowyer was sixth. Truex, the driver of the No. 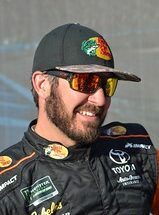 78 Furniture Row Racing Toyota was fifth in the spring and Joe Gibbs Racing driver Kyle Busch was runner-up – his fifth top-five at Phoenix in the last six races. “I feel okay about where we are and feel like we’re in decent shape going to Phoenix,” Truex said Sunday. “We’ll go there and race hard again and see what we can do. I think we need a little more speed to run with the Fords – they’re clearly really, really fast right now and if we’re off just a little bit we can’t run with them. Even needing to overcome a 25-point deficit, Kurt Busch seemed optimistic about his chances to rally into the championship field. It all comes down to one thing. “We’ve got to win, simple,” Chase Elliott said.